Let’s face it. While caravan camping is extremely fun, efficient driving while towing a large load is pretty much impossible without a caravan mirror. To help keep RV camping easy, Caravan RV Camping has hand-selected a premium line of name-brand caravan towing mirrors currently offered at amazingly low prices. The Australian brand Coast to Coast has developed a highly effective Coast to Coast Door Mount Mirror, improving on their previous model. 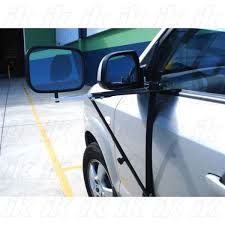 This improved caravan mirror (suitable for most 4x4s, cars, and vans) features rubber mounting pads (to keep your paint job looking slick), a ratchet T-Bar to help ensure the snuggest fit possible, and an additional larger-sized bracket and strap for vehicles with thicker door designs. In general, however, Camec seems to lead the caravan mirror game with a variety of beautifully engineered mirror models. For the easiest installation possible, check out the Camec Clip-On Mirrors or the Ora Rossa Mounted Towing Mirrors. 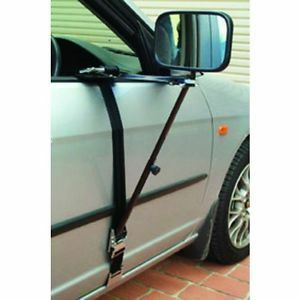 For a more durable model, however, the Camec Heavy-Duty Ratchet Strap Door Mounted Mirror is recommended. With a mirror sized 229mm by 155mm, and an adjustable extension arm for mounting, this Camec towing mirror is perfect for any bracket and ratchet strap system vehicle. If you’ve damaged your Camec Heavy Duty Mirror System, however, that’s not a problem. We also offer both the Camec Heavy Duty Strap and Mirror Head individually. While a caravan towing mirror is necessary, it’s not exactly a fun product to shop for. Give yourself a little break by taking the time to explore Caravan RV Camping extremely large online collection of name-brand products specifically geared towards solving every camping dilemma. Check out one of our top-rated RV appliances, like the high-quality Aircommand Cormorant Reverse Cycle Air Conditioner, a roof-mounted air conditioner advertising cooling, heating and defrosting capabilities, and designed with a digital display and remote control. If you have something specific in mind, however, our categorized brand-name online selection is sure to have it featured. For information on some of our other products such as camping microwaves and annexes flooring, please click on the provided links. Don’t forget: Our experts are always eager to answer any product-related questions (or take your orders) via telephone at 1800 RV PARTS (787 278), so let’s make this next camping trip unforgettable!